We enjoyed a real-life trip to New Jersey last October, so it was great fun to follow it up with a virtual visit through Little Passports! 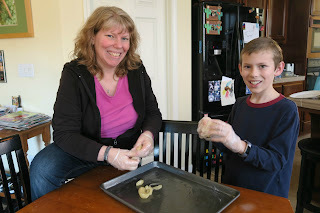 As always, Trevor and I learned a lot and had so much fun doing the activities together. First, we built the model, which was based on the boardwalk. We learned that the boardwalk in Atlantic City, four miles long and built in 1870, is one of the oldest and longest in the world. Wow! The map activity taught us about the Absecon Lighthouse, the Steel Pier, and Boardwalk Hall. Next, we did an activity about Lucy the Elephant, a sculpture in Margate, NJ. It was built in 1881 and is 6 stories high! There's an entrance in one of the back legs, and 22 windows to view the town as you climb up. Cool! The science experiment was inspired by the phonograph, invented by Thomas Edison while working in New Jersey. 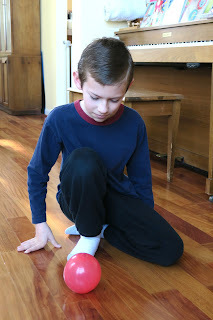 Here Trevor is testing what happens when you spin a balloon with a hex nut inside. It sounds like the balloon is singing! The balloon represents the needle of the phonograph and the irregular shape of the hex nut is like the grooves of a record. Did you know that one of the world's largest spoon collections is in Paterson, NJ? Me neither! There are more than 5400 spoons on display at the Lambert Castle Museum. The activity had Trevor and me looking very carefully at an illustration to find four pairs of identical spoons. It was really difficult to spot the tiny details in a matched pair. Next, we did a word search about Ellis Island and a maze about Hoboken. 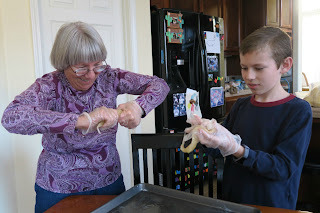 Our final activity, making the salt water taffy that was invented in Atlantic City in the late 1800's. 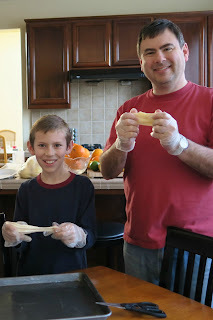 It was a family affair, as all of us (including Grandma who was visiting) spent time pulling the taffy. It was worth the effort, as the resulting taffy was delicious! 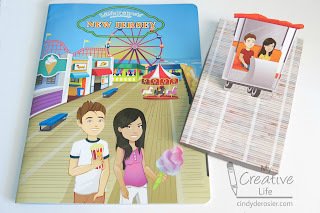 We had a lot of fun exploring New Jersey through Little Passports and loved the chance to get to know even more about the Garden State.